During my forthcoming November 2014 visit to Australia I will have 4 lectures at various universities and two in other locations (see listing below). All of the lectures are freely available for general public. There might be some differences in content between the lectures. I will also participate, as listener, in two events at the Wollongong University, co-organized by ICNIRP, ACEBR and ARPANSA. 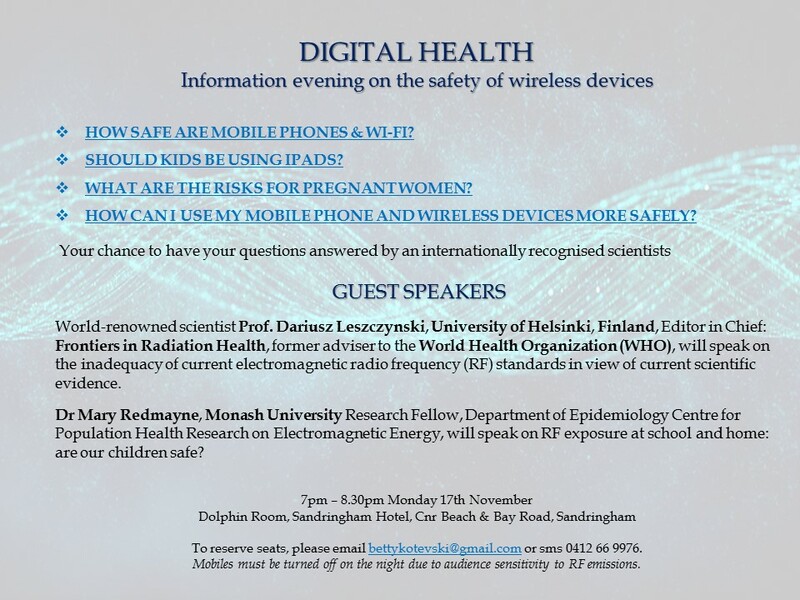 Cell phones were not tested for their human health safety before they were put on market years ago. It is the first time in the history of the human kind when we put the microwave radiation-emitting device directly to our head and expose our organs, including the brain. 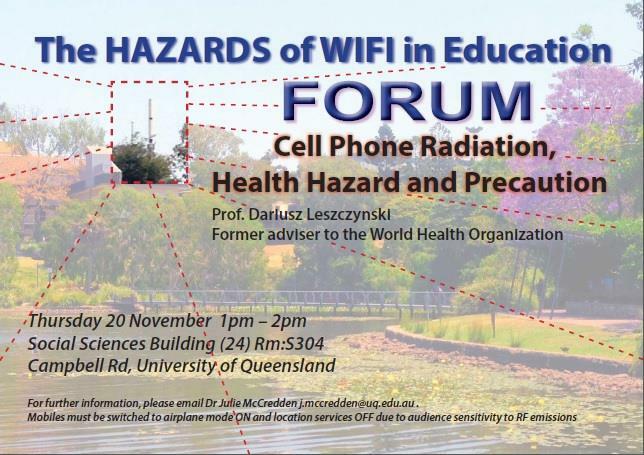 Engineers and dosimetry experts are convincing us that the cell phone-emitted microwave radiation causes only thermal effects and that any potential health danger caused by thermal effects is prevented by the 1998 ICNIRP safety standards. The 2011 IARC classification of cell phone radiation invalidates the protective claims of the current safety standards. 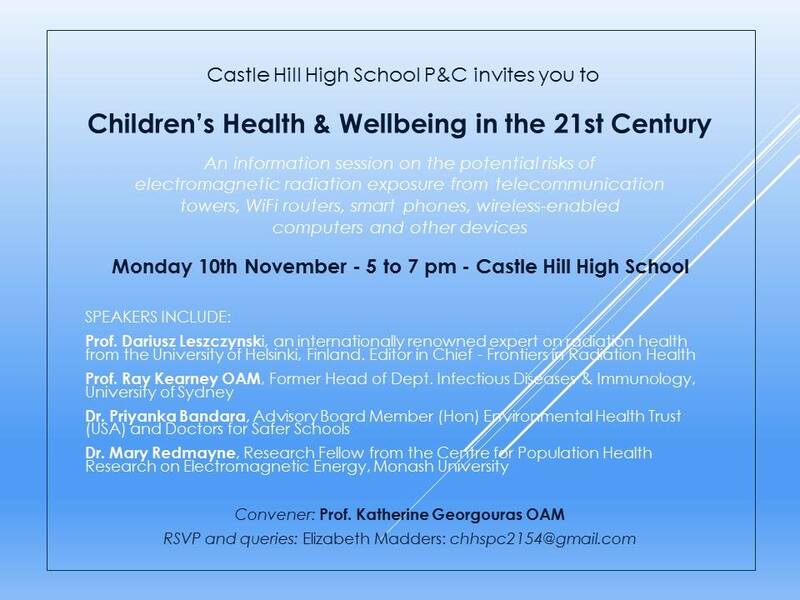 This entry was posted in Mobile phones and health and tagged ACEBR, ARPANSA, Australia, Brisbane, Castle Hill High School, cell phones, Hawthorn, ICNIRP, Melbourne, Monash University, precautionary principle, Queensland University, Sandringham, Sandringham Hotel, Swinburne University of Technology, Sydney, Wollongong University by dariuszleszczynski. Bookmark the permalink.